How long can I make my zip.drapes? You can make them as long as you want in multiples of 24” L. For example, with 1 Topper + 3 Extensions = 96” overall length. What if my drape length is not a multiple of 24”? Say I need it to be 84”L? You would need to purchase one pack of toppers , plus three packs of extensions. The last panel of extensions can easily be reduced in length. You would need to have it a finished length of 13” not 12” ( as 1” hides under the upper flange). Due to the size of the extensions, these are easy to sew on a kitchen table, or your local tailor could shorten them. What are the dimensions of the Topper and Extension panels? There are two (2) sets of panels in each package. So if you order one (1) quantity Toppers, there will be two (2) 50” w x 24” L Toppers in each package. If you order one (1) quantity of Extensions, you will receive two (2) extension panels 50” w x 24” L.
What Heading options are available? We offer two styles of Toppers, Pocket and Grommet. The Pocket Topper is a multi-function Rod/Loop pocket and flat heading. You can achieve three header styles with the Pocket Topper. The Grommet Topper is available in a nickel finish and has a an inside diameter of 1-9/16”. Click here learn more about our Heading options. What size rod can I use with the grommet heading? How many colors are available for the toppers? What colors are available for the extension panels? Extension panels are available in 12 colors. They are: White, Cream, Navy, Orange, Beige, Magenta, Apple, Aqua, Turquoise, Gray, Black, Lime. Can I order all my drape in one color only? How do I wash and care for my drapes? Wash in cold water by hand. Air dry and iron on medium heat. What is the fabric content of Zip.Drapes? Panels are made from 100% Acrylic fabric. Can I use Zip.Drapes outside too? Yes, the fabric is outdoor quality. What are the zippers made from? How do I assemble the panels? They zip together horizontally from right to left and are hidden by a fabric flange back and front. Yes, free swatches are sent by mail. A maximum of five (5) colors may be ordered. Click here to order your samples. Samples will arrive within 2 weeks of ordering. 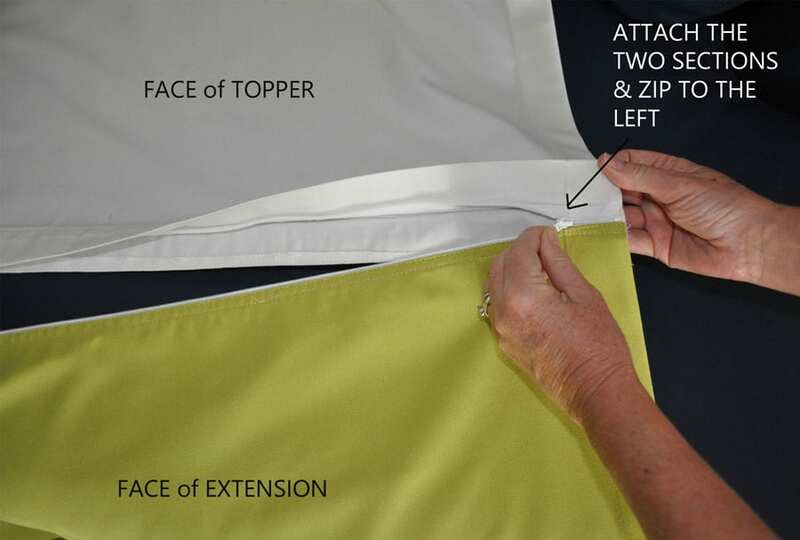 Use our step-by-step ordering form to select the Topper style and colors for you Zip.Drape. I already have a Zip.Drape but want to change colors. How can I order replacement panels? Visit our Shop page and select whether you need to order Toppers or Extensions, then select the color you want and add it to the cart. We accept all major credit cards including Visa, Master Card, and American Express. If an item isn’t the perfect match, return it for a refund within 30 days of delivery in the original condition. To return an item, use our contact form to send us your order number, date of purchase, and reason for return. How long will it take to deliver my drapes? The best way to contact us is by filling out our contact form and clicking submit. Someone will get back to you as soon as possible.